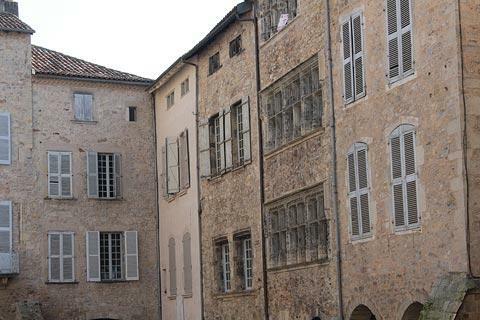 Villefranche-de-Rouergue is a bastide town in the Aveyron department of the Midi-Pyrenees, 40 kilometres west of Rodez with its origins in the 13th century: the town was founded in 1252 by the Count of Toulouse, Alphonse de Poitiers. 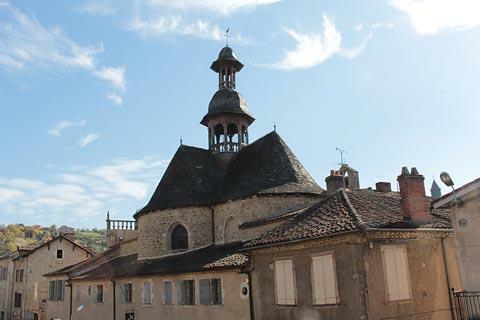 The town was partly built on land belonging to the Bishop of Rodez who was not too pleased and excommunicated some of the first inhabitants of the town! 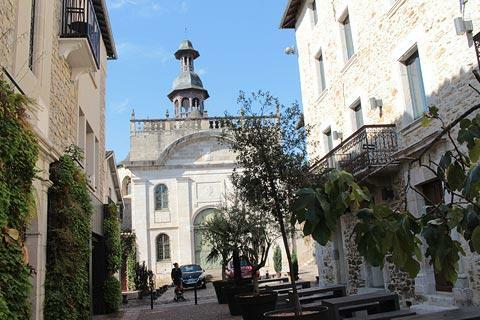 The town is unusual among the 13th century bastide towns of the south-west of France in that it is largely uncommercialised and remains very much a typical French town. 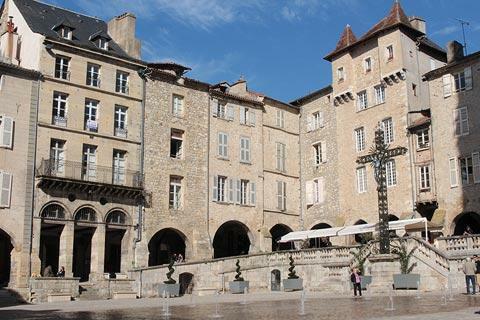 Villefranche-de-Rouergue also retains its original layout, with a central square and church surrounded by a grid of parallel streets: this layout is found in the majority of bastide towns. The principal highlights are in and around the central square, the chapels to the north of the town, and along the river Aveyron to the south of Villefranche-de-Rouergue, but you will also want to stroll along some of the other streets to see the medieval houses, in stone and colombage. There is parking available in several places along the boulevards that surround the town centre: the free parking is close to the town so there is little reason to pay to park in the town centre. 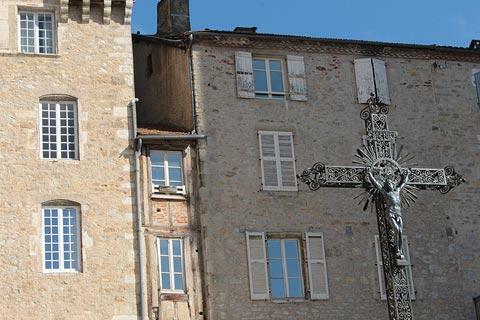 Whichever way you approach the centre from you will quickly reach the main square, the Place Notre-Dame. 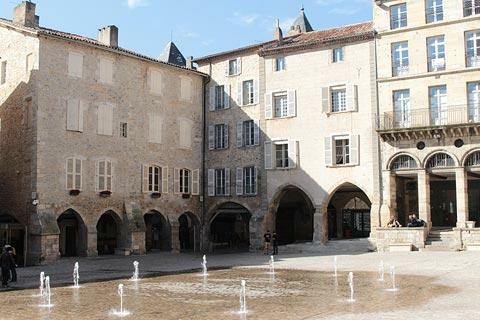 The Place Notre-Dame is an almost perfect bastide town centre, with intact arcades around the edges of the square, and tall attractive medieval houses above the arcades. 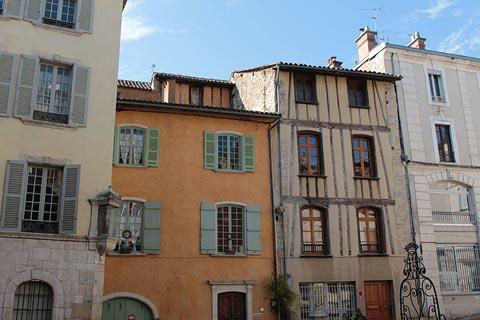 This main square in Villefranche-de-Rouergue is on a slope, the houses surrounding the square are taller than those found in most other bastide towns and the Place Notre-Dame is one of the most impressive bastide town squares that we have seen in France. 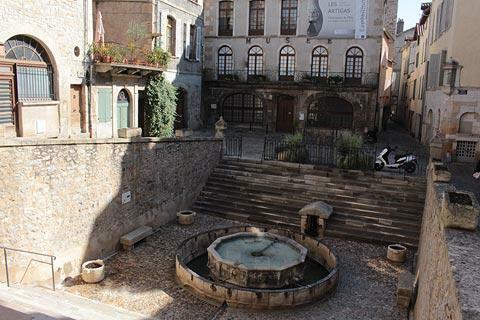 There are several sites of interest around the square, including the Maison Armand, the Maison Dardenne and the Ancient Hospital of Saint-Martial so be sure to walk around the edge of the square where you will find several information boards highlighting the points of interest. 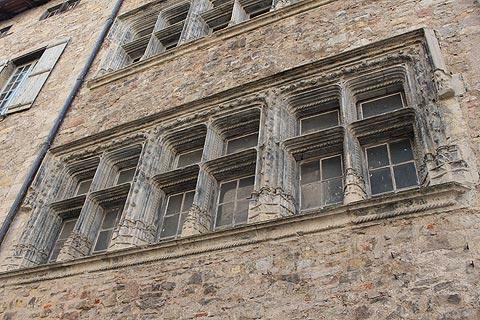 The lead windows and their decorative stone surrounds of the Maison Armand are a highlight and represent the Archangel Gabriel and Mary during the Annunciation: this house was built at the end of the 15th century after a fire destroyed many buildings in the square. One corner of the Place Notre-Dame is dominated by the Collegiale Church of Notre-Dame and its oversized belltower and entrance porch, 58 metres high. 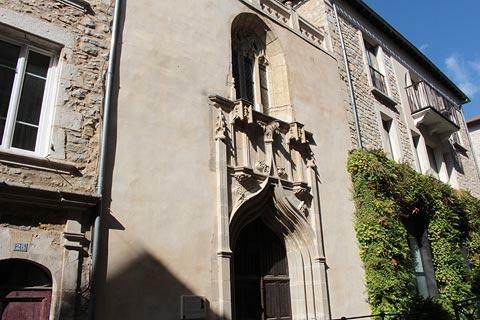 The church was built during the two centuries from 1260 and originally housed 26 monks. 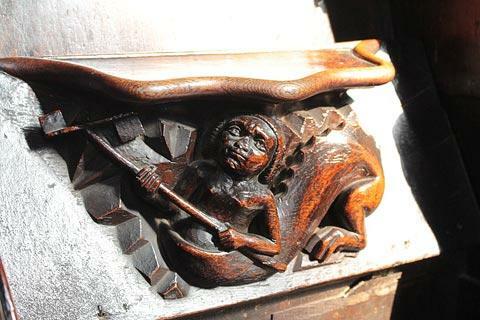 Take a look at the 15th century stained glass windows inside the church as well as the lovely wood carvings in the 15th century stalls. 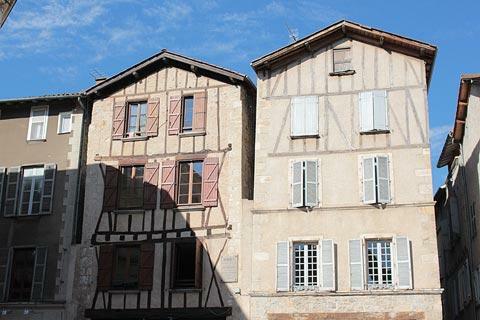 Among the many medieval houses in Villefranche-de-Rouergue close to the square there are some that are particularly noteworthy, including the Maison Gaubert on Rue Marcellin-Fabre and the Maison Combettes on Rue du Sergent Borie. After exploring the square you can stroll north along Rue Saint-Jacques to see the Chapel Saint-Jacques, with a facade built in the gothic flamboyant style in the 15th century, and the Chapel of the Penitents-Noirs: the unassuming outside of this 17th century chapel gives you litle clue to the beautifully painted interior, in the baroque style, and the impressive altar (entrance 4 euros). Return to the Place Notre-Dame and take the Rue du Consulat from the southern edge of the square that leads to the Place de la Fontaine where you can see a 14th century fountain opposite the town museum, the Musee Urbain Cabrol. 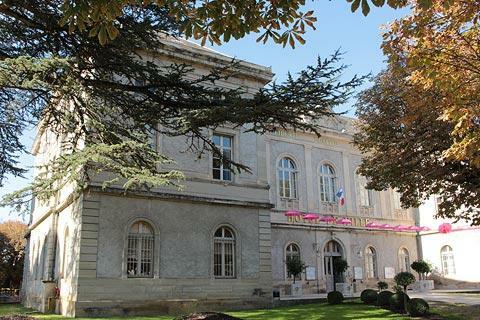 From here continue along Rue du Sergent to see the 19th century Town Hall, originally built as the town Palace of Justice, and the Villefranche-de-Rouergue Tourist Office. 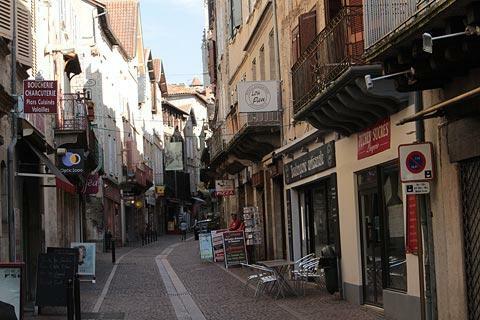 This street, the Promenade de Guiraudet, is in the position of one of the moats that once protected the medieval city. Next to the Town Hall you can see a War Memorial erected to commemorate the soldiers who died in the war of 1870. 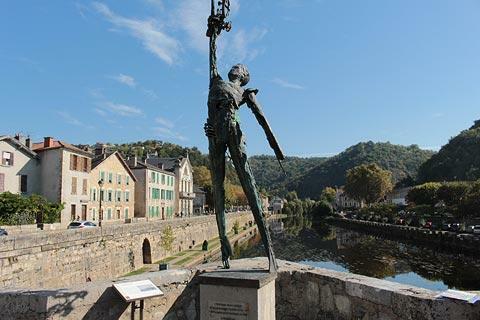 You are now next to the river Aveyron where you can see the old stone bridge, the Pont des Consuls, and admire the views along the river in both directions. 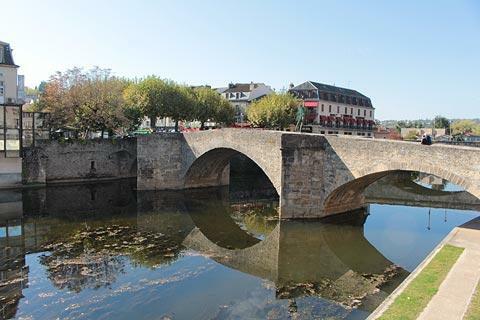 Unfortunately the bridge, with its origins in the 14th century, no longer has the towers that once formed part of the structure but you still get nice views along the river to the hills around the town. 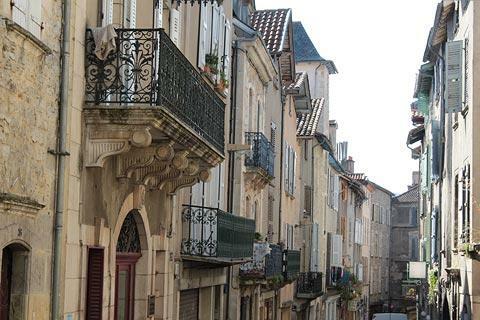 Market day for Villefranche-de-Rouergue is Thursday, and is the liveliest day to visit the town. The Chartreuse Saint-Sauveur (just to the south out of town on the Gaillac road) is a lovely ensemble of monastic buildings and has two very impressive cloisters (one of them is the largest in France), stained glass windows and some interesting woodcarvings on the stalls among its many features of interest. 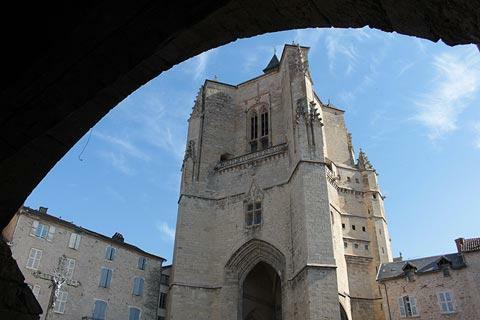 Despite the relative isolation of Villefranche-de-Rouergue there is much to enjoy in the surrounding region. Among our favourite places are the picturesque village of Belcastel to the east, and the town of Najac to the south.